I thought I would come back to a bit of simple styling this week for another nosey into my house and hopefully a bit of inspiration. 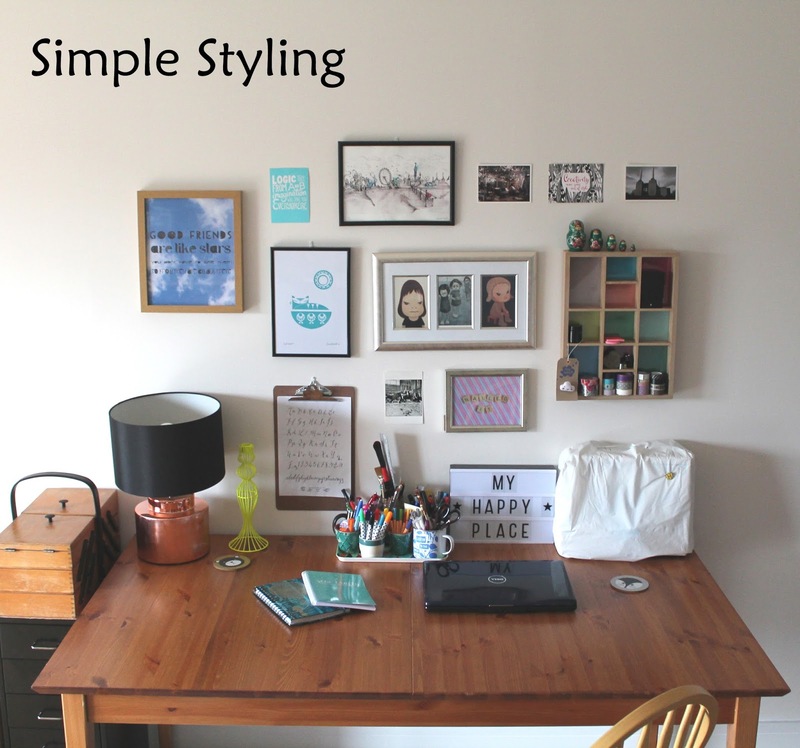 I am nearly there with my workspace and so I thought this would be a good time to show a bit of simple styling. The rest of the workspace involves shelving and hiding things away in boxes and so not much to show there. To start with the Table was given to me by my folks and it does extend out so a great thing to have around and the chair is from the local charity shop. Anyway, I started with a bit of planning for this project, working out where and what pictures I wanted to use. I have so many, oops. 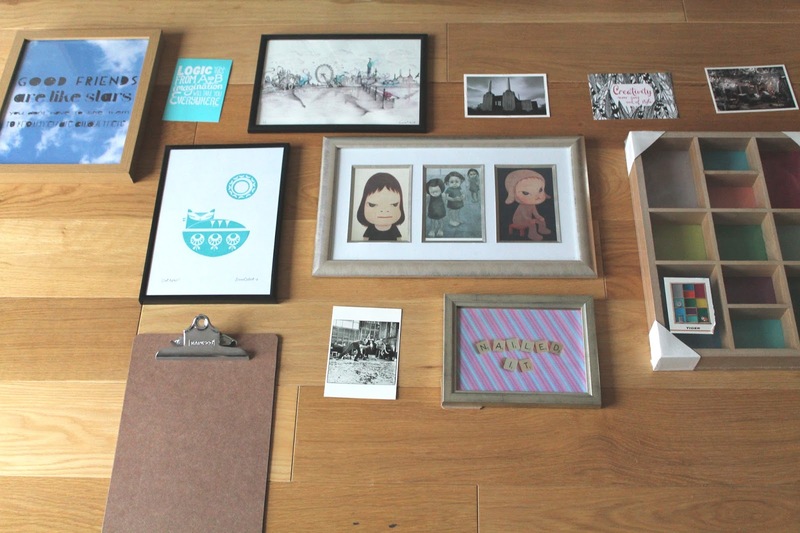 Also, a mix of postcards and frames and useful things like the printers tray style box. I don't have any shelves in my flat as it is a new build, so everything has to be added if I want storage or places to add my little nicknack's. I wanted to create the Gallery wall effect as I really like that as a creative splurge of items. I wanted to have pictures that inspire me and that I love. Some of these pictures are from such a long time ago and I still love them now. From top left - Sammy made me this laser cut on her Silhouette a few years ago. Blue Postcard - from Paperchase. London Scene - I bought this when I moved out of London 3 years ago, its by Lost Monkey. Postcards - Photographer Jeff Wall Image, Paperchase postcard, Battersea power station. Printers style tray from Tiger. Three images in one frame - 2 outside images by Yoshitomo Naro, middle image made by a patient at Bethlem Hospital, held at Bethlem Museum of the mind. Cat nap image by biroRobot. Calligraphy from the Quill London workshop I did a few weeks ago on a clipboard. Postcard of Jackson Pollock Painting. Nailed it image by Claireabellemakes. My workspace has a few different roles and so it needs to work as a laptop place, sewing space, crafting space and an actual dining room table when anyone comes to visit. I will be adding storage under the table and so when the table is pulled away from the wall, it won't look too odd with the Gallery wall. Also the lamp and sewing machine can get placed on the top of the storage. 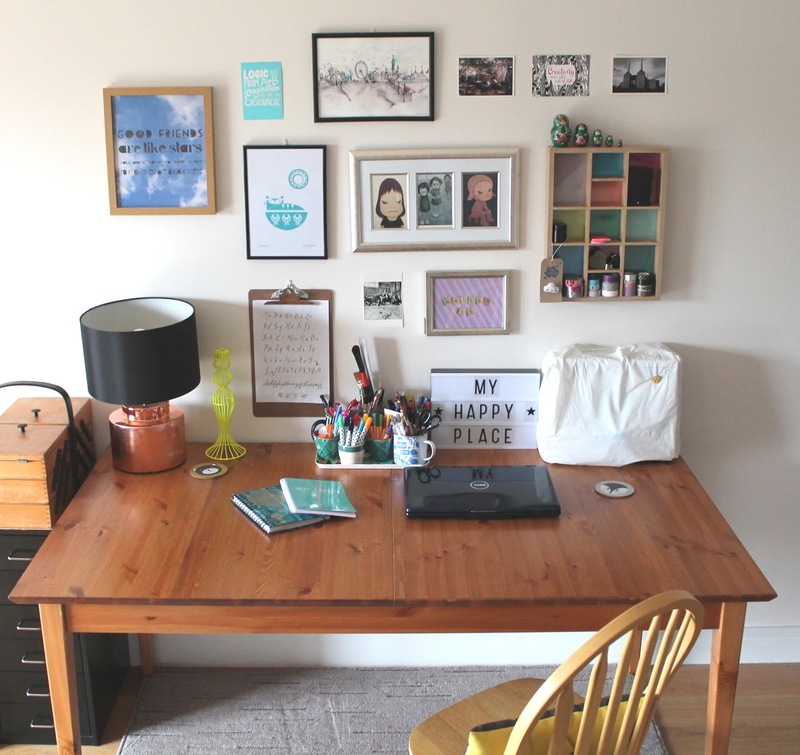 What's on the desk: The Lamp was from TK Maxx, Candle holder from Oliver Bonas, Various pen pots and mugs, Lightbox from Violet and Percy, sewing machine, Laptop, Sewing Journal from Sew Crafty, Diary from Paperchase and coasters by Karin Akesson. To the left of my desk is a filing cabinet that was from Lidl a few years ago (I think Ikea do similar) and my sewing box. I think that's about it. Full disclosure - my desk does not look like this all the time, all the crap was behind me! So what do you think? I love how it has worked out, all the little calculations of spacing and how I wanted it to look have come across and it's great to have a workspace laid out. I might actually get on with all the stuff I need to do now. What space do you use for work/play? 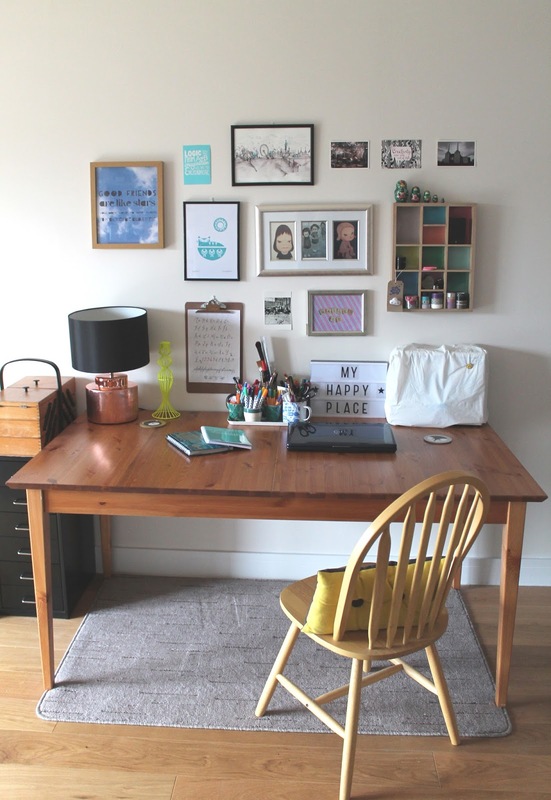 Do you have a dedicated space for all things or as I used to do, it was laptop on my lap on the sofa, desk for sewing and all my crap and find a space wherever I could to do some crafts. Hope your having a good day and not getting too wet out there! It's pretty miserable today. Ha ha, love that Anna! Not odd at all. I didn't think anyone would notice, but yes that's why I did it, had to get the right size rug to keep the toes warm in the winter! At least we know we are not alone! Got to love the it just fits thing.